I was recently reading an article on Website Magazine that touched upon a topic about which I have some pretty strong feelings. The article discusses the recent surge of online content and the importance of that content being high-quality. The article brings up the point that if the content is not high-quality and contains typos or grammatical issues, then there can be detrimental results. Not only are web users turned off to your work, but search engines do not look fondly on poorly written content either. In fact, Google and Bing may even block your website from appearing in their search results if your writing contains errors. Content marketing is clearly an essential tactic in your marketing plan but only if executed correctly. Make sure the person writing the content is experienced and well-versed in all things writing. Don’t let anyone publish anything official until it is proofread or until you trust his or her writing. Errors in your writing can be the “make or break” moment when a potential client decides to hire you (or not). One small typo even in the Title Tag might completely turn off a customer. While many people might not be so concerned about typos like I am, you can’t ignore the few people who might care! If you are going to outsource your content, do some research first. Check out the company’s or person’s website and blog to see how he or she writes. Are there any obvious grammar issues or typos? If he writes his own content so carelessly, how will he treat yours? 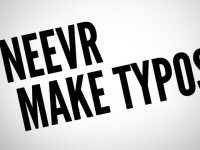 I’m not saying if you have a typo on your website, blog, Facebook page, etc. that you’ve signed your death wish. It’s just something that is so easy to control and fix. I catch typos on websites all the time and that site then loses at least some credibility in my book. Proofread all your work and if you ever see an error, fix it immediately. Remember, you can only make one first impression!